Glass-doored cabinets are another thing I'll eliminate from any wish list for a future kitchen. 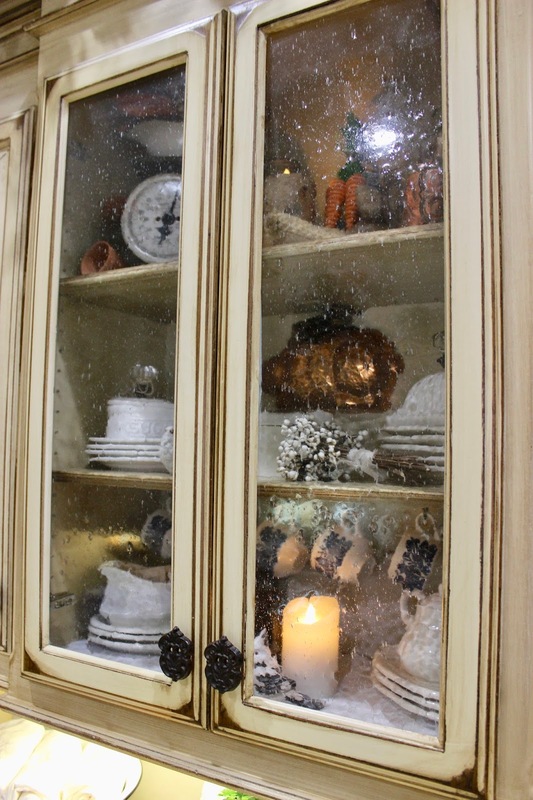 If we were staying here a few years longer, I'd remove the glass doors and add trim to make this cabinet into open shelves. In my opinion, glass doors just make the shelves behind them harder to use. What do you think? Are you a fan of glass-doored cabinets or would you rather just have open shelves instead? These glass doors are made to look old with the old-fashion glass that has bubbles in it and kind of makes it look wavy. For now the glass doors will have to stay as we are downsizing our belongings with the intent to sell our house in the near future. Painting the inside of the cabinet is a possibility, but for now just cleaning the clutter was enough for me. To get the cups up off the counter and to put some color in the drab cabinet, I decided to add cup hooks to the middle shelf. That entailed another round with the despicable "cup-hook math" which I find so overwhelming. 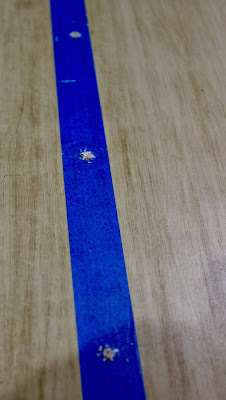 This time I laid a long piece of painter's tape across the shelf in the position where I wanted the row of cups to hang. I marked the middle of the board with a line of chalk. Then I just eyeballed the position of three cups on each side of the middle line. 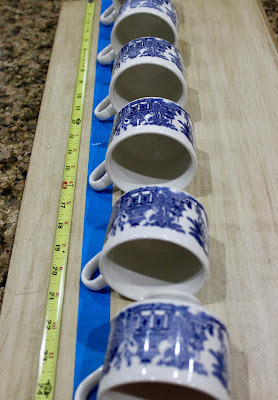 Last time I hung cups in the china cabinet HERE I tried to get all perfect with the math. This time I decided to go a little easier on myself. 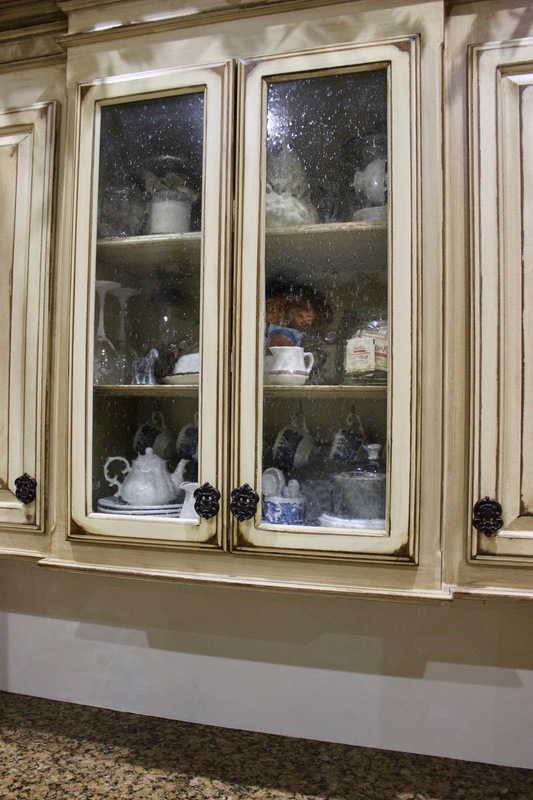 What happened to the china cabinet you might ask? It's getting stored in an effort to minimize furniture to just the necessities. Less furniture = bigger rooms right? Yep, thought you'd agree! 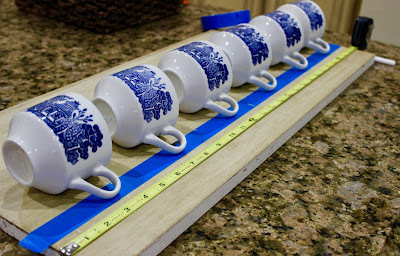 Since these are small cups and I might want to put larger cups up in the future, I spread the cup hooks a little farther apart and limited it to just six. 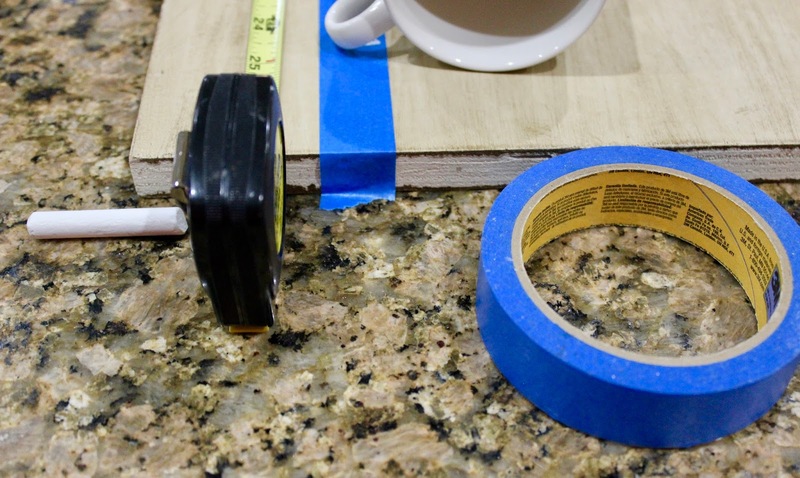 Here's all you need to make your own professional cup hanging kit...Painter's tape, measuring tape, and a big ole piece of chalk! Any advice about prepping a house for sale would be appreciated. Do you have any special tip that worked for you? 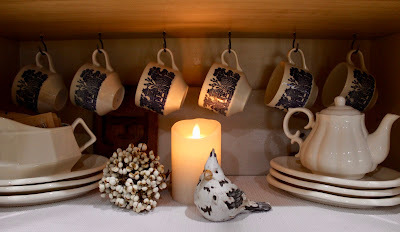 I'll be sharing at the here Share Your Style party and here at the Keep In Touch party this week, hope you'll join me. 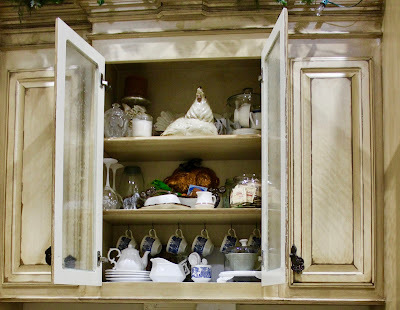 I have glass-door cabinets in my kitchen but the glass slides not opens. I spend so much time cleaning them but there are always prints. So frustrating. And yes, not that great to use. I have some glass doors too, mostly I ignore them. Open shelves get dirtier so I'll stick I'll stick with the doors. We've talked about downsizing, but it's just too much work. We just stopped using the upstairs. You are so right about how much work it is. But we want to spend 6 months to a year traveling a lot and our current house and yard need more attention than we want to give our time to. Open shelves look pretty but are dust magnets. I actually like my glass cabinet since it makes me stay neat. I purged my kitchen last year and did a mini purge last month again. We will probably move in the next year too. I am trying to get rid of stuff now. I have seen houses sell faster when they look emptier. Well, it looks terrific. But your question is a tough call. In the kitchen, it's best for me if I have solid doors -- I'm afraid I have far too much crammed in to make glass doors or open shelves look good! 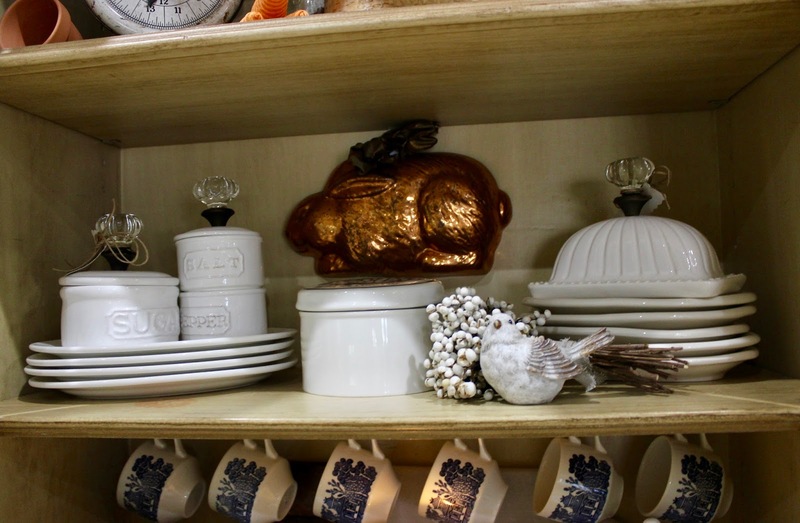 But if I had to choose, I'd pick the shelves -- and they would probably end up with bunnies and cookbooks and teapots! Alas poor Tupperware! Where would you go? 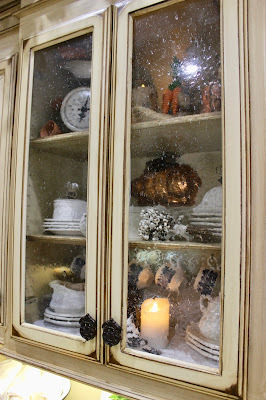 I really like glass door on cabinets and have some in the new house. 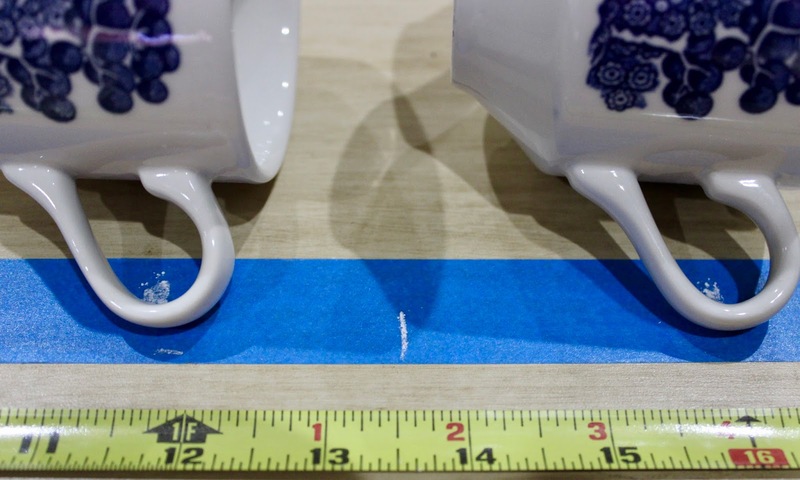 What a great idea to use tape to mark out where the cups go. This is why I like bloggers; they have the best ideas. Thanks Barbara. Necessity is the mother of invention as they say! I always look for an easy way to do it. 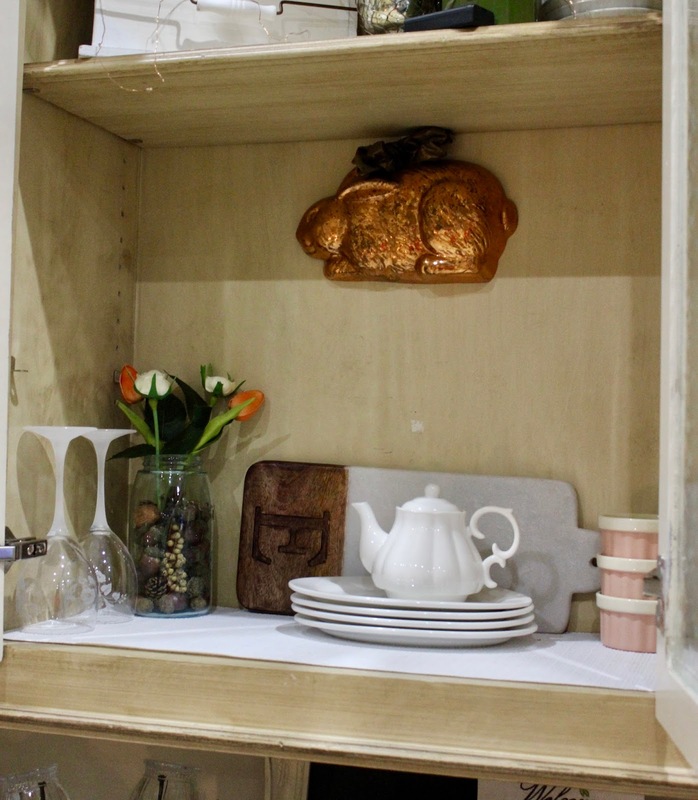 We have two cabinets with glass shelves and I love them. The glassware and pretty china serving pieces are stored there. They bring so much color to a space that can be overpowered by nothing but cabinets. Shelves in a kitchen collect both dust and grease - at least that's what's on top of my cabinets. Kim, with the candles I would say I found buying ones a bit more expensive turns out best as they last forever and look the most real. What a great idea. I love stuff under glass but it does minimize the space.Thanks for linking up to Keep In Touch.